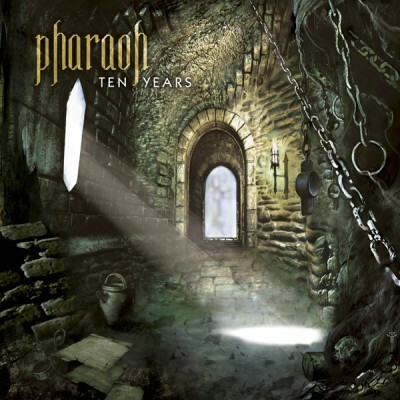 June 7 is the date when the power metal group Pharaoh released their latest album. The record is Ten Years and was released through Cruz Del Sur records. This is my first encounter with any music from the band and I was quite pleased. I had heard many great things and though they are not fully embodied through this album, it is surely shown here that there is merit to the compliments. Ten Years is a power metal album with subtle hints of heavy metal influences. It is rather distinguishable as American music due to its harsher vocals and more heavily distorted guitar tones with respect to the general power metal scene. The music is generally guitar riff based and supported with powerful double-bass drums and heavy basslines. And of course, the vocals are quite strong. Most of what is presented on Ten Years is rather typical, but executed at a higher level. Nothing too new is offered, but there is a fair amount of variety within the power metal genre. There are some hard riffs (such as on “Ten Years”) as well as some big, long note rhythms (such as on “White Light”). There is a fair amount of depth in the drumming considering the limitations placed upon them by the genre. Also, the bass gives the odd standout groove, like at the end of “White Light”. The vocals, though nothing too technical, are easily identifiable and give a healthy gruff edge to the music. They are well-phrased and fitting with the rest of the band. In Ten Years, the guitar is the most interesting component. Some of the riffs are only decent, but there are great rhythms and melodies. The acoustic part in “White Light” is beautiful, and both the chorus and intro leads in “Reflection and the Inevitable Future” are marvellous. There are great harmonies throughout and thick layering of guitar tracks. This of course refers to “Nothing I Can Say,” which is an extremely guitar-dominant track. Of course, all instruments are very well done, but the guitar is no doubt the primary. Ten Years is a great release, albeit a little safe. The execution is commendable, but the inventiveness is not exactly outstanding. The EP is at a very high level in a familiar field. Everything is done very well, from the instrumental performance to the general songwriting portion, but also has been done before. Still, it is a highly enjoyable listen and a recommendation to fans of the band or genre.